Leading the pack is Future Retail Ltd that zoomed over 191 per cent till date. 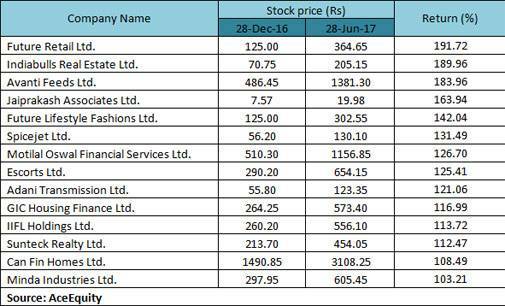 After the Indian benchmark indices witnessed a massive bull run in the first six months of 2017, as many as 14 stocks in the BSE-500 list have soared to fetch over 100 per cent returns, turning multibaggers in just a short period of time. Leading the pack is Future Retail Ltd that zoomed over 191 per cent till date. On June 29th, 2017 the scrip was trading 0.49 per cent higher at Rs 365.40 as on 1.20 pm (IST). The company is the retail arm of Kishore Biyani-led Future Group that operates value and lifestyle retail stores. 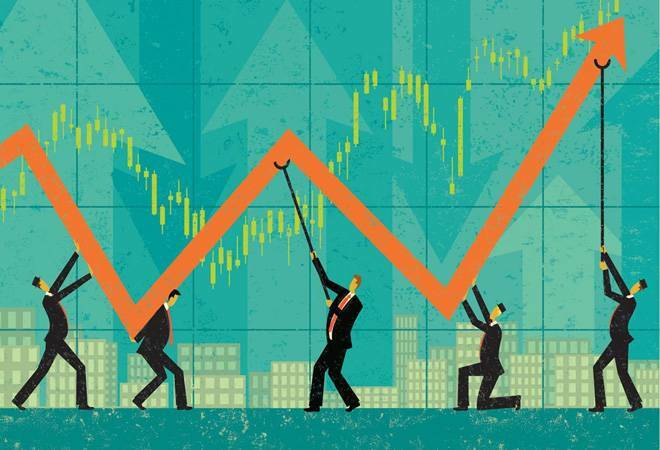 The company posted a 17.3 per cent rise in net profit at Rs 123.05 crore for March quarter with its total revenue from operations was climbing 25.3 per cent higher at Rs 4,483 crore. In May, Future Retail announced that it plans to set up 4,000 'neighbourhood' stores in the next 3-5 years. Following Future Retail is Indiabulls and Avanti Feeds that have given over 189 per cent and 183 per cent respectively. Avanti Feeds, interestingly, started off as a small business based out of Vizag. It initially catered to a niche market but has now expanded to B2B and B2C. The company is now a market leader in manufacturer of prawn and fish feed and a shrimp processor and exporter. It is continually expanding in all value chains. Moreover with a increase of health consciousness, Avanti Feeds has successfully ensconced in the pro-health market. Indian low-cost carrier Spice Jet , too, has outperformed in the market. SpiceJet recently made headlines as it was ranked the best performing airline stock in the world by Bloomberg Intelligence Index, gaining more than 800 per cent, creating a $1.2 billion market value. Spice Jet has placed an order of $22-billion for Boeing planes and received praise from US President Donald Trump over the deal.